Want to open up a can of worms? Discuss shoes and orthotics with professionals. It quickly will devolve into a classic Budweiser “Tastes great, Less filling” commercial. My answer to the debate: It depends. Some people need orthotics; some people will be harmed by them; some people should be barefoot and others should never be barefoot. How do you know which you are? Where do foot problems begin? The old “Nature/Nurture” debate again… I have had the privilege of knowing three generations of people with bad feet. Amazingly, grandma had ugly flat feet that were merely an older version of her grandson’s feet. Definitely something genetic was going on! But are our feet doomed by our genes? Not necessarily. You can alter many genetic abnormalities through proper training. Here’s an example: Bunions. Bunions develop because the abductor muscle that is supposed to pull the big toe out to the side either is not there or is rudimentary (not developed properly); Nature or genetics. Muscles pull bones and, over time, the absence of muscle will distort skeletal structure. The big toe, which is used every day, will alter due to muscle imbalance. So, if you can recognize a rudimentary muscle in a child’s foot and develop it, you can make that muscle normal and avert future problems. If you have bunions and your child does not, read my article on how to fix them before it is too late. So, what should you do about shoes and orthotics? It depends. Let your children walk barefoot as much as possible especially if they do not have very flat feet. If you want to protect their feet, have them use sock or buffers without “support”. Walking from an early age will develop their arches and feet muscles and they will be able to walk easily on almost any surface. For adults with decent feet (not very flat or very high arches), I recommend going barefoot as frequently as possible and use low profile shoes. For adults with high arches, I think high heels and other shoes are usually okay, but do not wear orthotics. 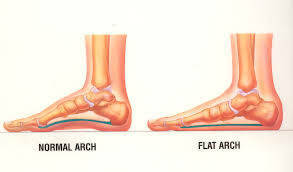 (Why wear an orthotic, which boosts the degeneration of your foot’s structure into a higher arch?) For adults with flat feet I believe orthotics can help and are sometimes very necessary. However, recognize we actually have three arches in our feet. The foot is very similar to the hand; think of the many positions your hands can take while doing a push up. 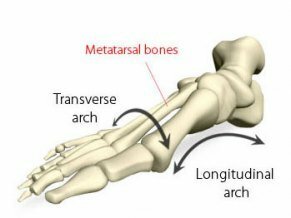 The most important and most overlooked arch is the metatarsal or transverse arch. The majority of Orthotics offered tends to limit support to only the longitudinal arch, thus further weakening the others. If you have medium arched feet or if you are young or athletic, I recommend that you do not use any support and select a no-low impact shoe.